Elegant Carved Brass Censer for use with incense charcoal and resin incense like copal or Jade Oracle incense. Screen top allows for even burning and ash falls neatly to the bottom. This is a very attractive piece--both decorative and functional. 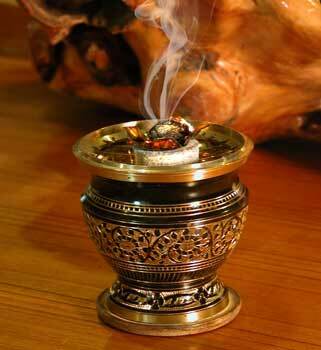 We recommend the use of of a bit of foil under the incense to keep it from direct contact with charcoal. This keeps it from over heating too quickly and also keeps your censer cleaner. Package of 10 quick-lighting charcoal tablets, for use with copal and our Jade Oracle incense.